The Fourth of July is a big celebration for all my US friends, sometimes they don't quite get why we don't celebrate it in the UK...er...well...we lost! I don't hold that against them though, in fact let's face it, most of us are simply looking for an excuse to celebrate anything! So here is my celebration recipe of Peanut Butter, Oat and Chocolate Chip Cookies made with Duerr's Peanut Butter, it's super smooth and made with American peanuts, it blended perfectly in the cookies and would also be delicious in that all American favourite the Peanut Butter and Jelly Sandwich. I can't claim this recipe as my own, it's a fabulous one from Sally's Baking Addiction, definitely a site to visit if you love Peanut Butter. Sally has created these gluten free cookies which are really easy to make and create a soft and delicious cookie. I only deviated from the recipe slightly, by using chopped chocolate chunks rather than bought choc chips, mmmm bigger pieces of chocolate. 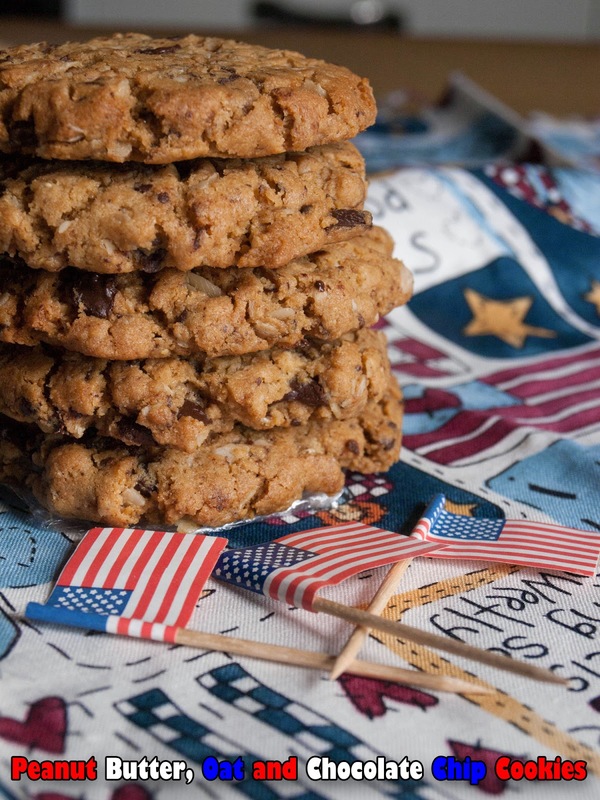 I thought you might be interested to know that I bought the fabric in the cookie photograph, in California in 2007 and the US Flag picks I bought on my very first trip to the States in 1980! I'm adding this cookie recipe to Jacqueline, Tinned Tomatoes and Lisa, Lisa's Kitchen monthly challenge: Bookmarked Recipes, it's a while since I posted for this challenge so good to get back in the game. 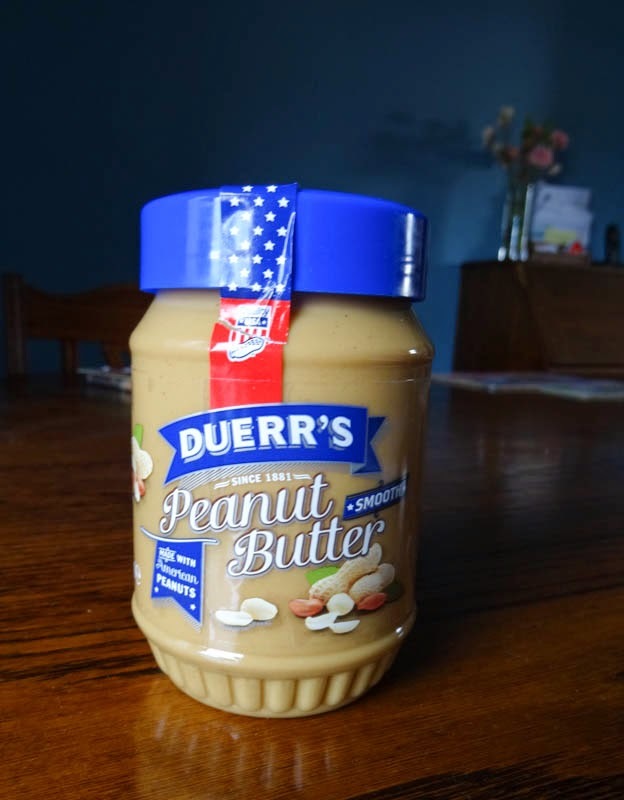 Thanks to Duerrs for the Peanut Butter, I was not paid for this post and all opinions are my own. Can't beat peanut butter in cookies, and these looks truly yummy scrummy! I might even make some for the monsters, I'm sure they'd make for very happy kids! Oh my goodness Janice, those flags go back a bit! And oh my goodness, those cookies look delectable and they look such a perfect shape too. Yes, no additional butter or flour and husband approved! I'm sure they would love them Lou! I know, it's shocking the things I have kept, but there are only so many times that you need stars and stripes sandwich picks!